The eyes on these bears can come off, posing a choking hazard to young children. This recall involves about 800,000 11-inch (28cm) and 18-inch (46cm) State Farm Good Neigh Bears with plastic eyes. The bears are brown and wear a white and red State Farm shirt. 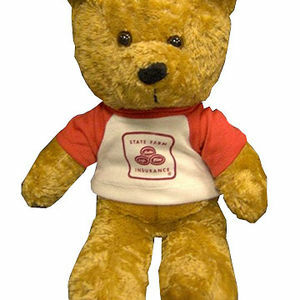 The bears were given away free through State Farm agents and at State Farm-sponsored events from September 2005 through March 2007. Take the bears away from young children and discard them. For more information, contact State Farm toll-free at (877) 226-8079 Monday through Friday between 8 a.m. and 4 p.m. CT, or visit www.statefarm.com.